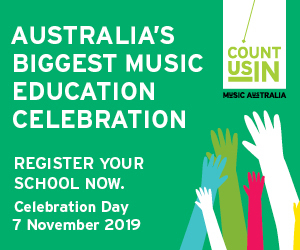 In fantastic news, the Minister for Education, The Hon Dan Tehan MP has announced the Federal Government will extend the funding of Music Australia’s national education program, Music: Count Us In (MCUI) for 2019. This ensures that over half a million students will be able to participate in a formal music education program this year. The Federal Government announced it will provide an additional $450,000 in funds for 2019 to support Australia’s largest school-based music initiative. In 2018 MCUI saw 745,000 schools students across Australia join together in singing one song at the same time all over the country. MCUI brings music education to students and teachers by providing resources and skills development opportunities for teachers. MCUI is delivered by Music Australia. MCUI culminates each year in an annual Celebration Day event where students across the country join together, singing the same song at the same time. Last year’s main Celebration Day event was broadcast live from Hobart around Australia. You can see some photos of the event here.